Gov. 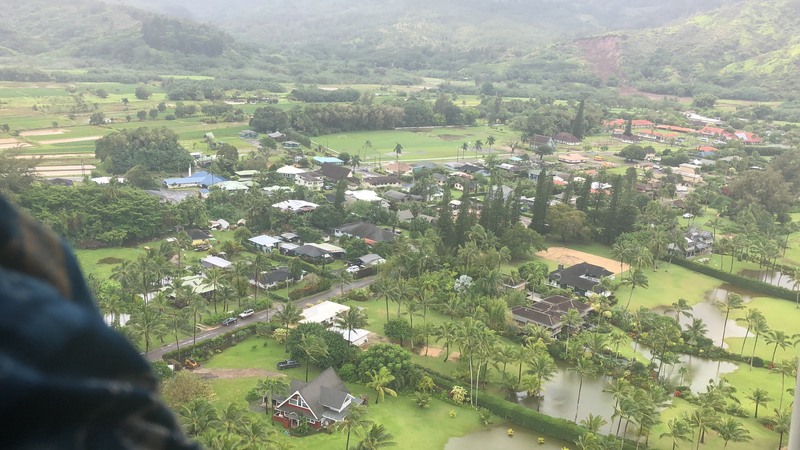 David Ige and Kaua‘i Mayor Bernard Carvahlo survey Kaua‘i from the air. Courtesy photo. 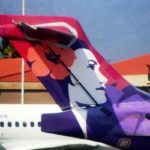 Multi-agency relief efforts have ceased for tonight and will commence tomorrow morning, Tuesday, April 17, 2018, for residents and visitors stranded in Hā‘ena and Wainiha according to the Kaua‘i Island Utility Cooperative (KIUC). 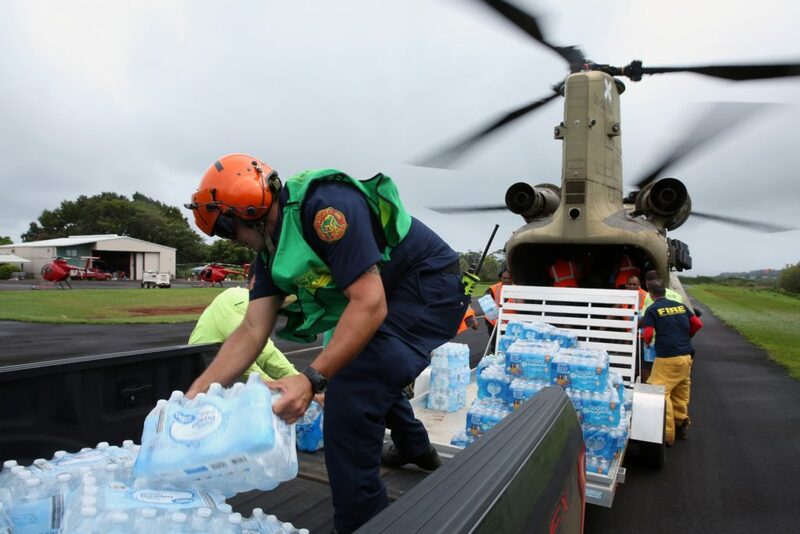 National Guard, U.S. Coast Guard, Kaua‘i Fire Department, Kaua‘i Police Department and the American Red Cross work together to bring water and supplies into Wainiha and Hā‘ena. 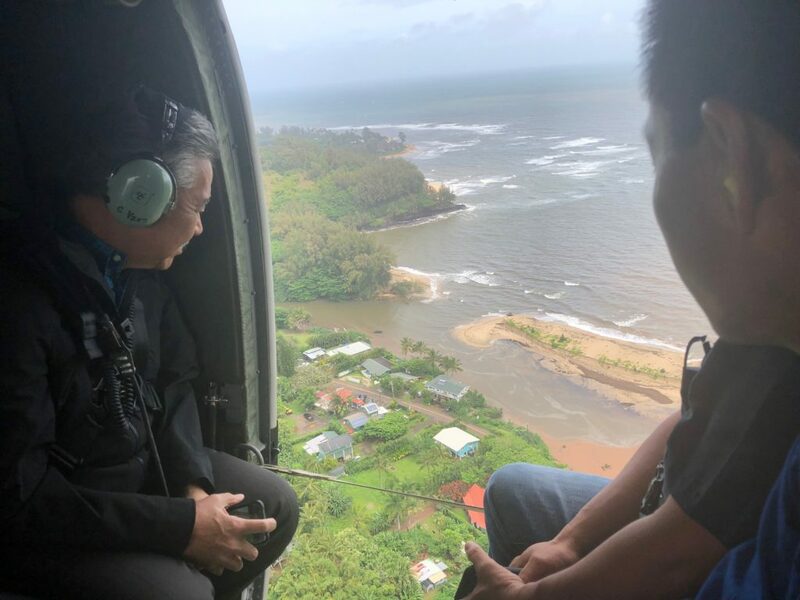 The U.S. Army, National Guard, and the County of Kaua‘i have airlifted over 220 people from the Hā‘ena and Wainiha area. Those who need to be evacuated can go to the Wainiha landing zone located just east of Ala Mihi Road between approximately 8 a.m. and 4 p.m. tomorrow, weather permitting. Those who wish to be evacuated are advised that it is unknown at this time when they can return home, as landslides continue to block access along Kūhiō Highway between Waikoko and Wainiha. Kūhiō Highway near the Hanalei Bridge is open to the public as repairs to the bridge were completed this morning. 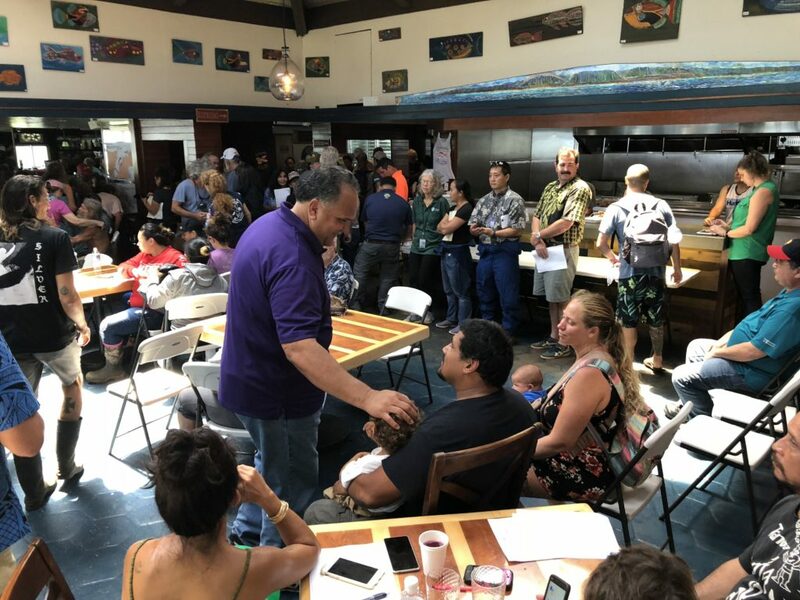 Upon reopening the highway, the Kaua‘i Bus worked with the American Red Cross to shuttle 121 people from the Hanalei Shelter back to Princeville. With the reopening of the highway, the shelters at Hanalei Elementary School and the Church of the Pacific are now closed. The Department of Education has announced that due to the need to address roof repairs, flooding issues and safety concerns, Hanalei Elementary School will continue to be closed on Tuesday, April 17, to allow for repair and clean-up of the school facilities. School will resume on Wednesday, April 18. The Department of Water reports that power has been restored to its Wainiha pump stations which will allow water services to be slowly restored to customers in the Wainiha and Hā‘ena area. However, DOW has issued a “do not drink” advisory and a conservation notice for Wainiha and Hā‘ena customers. Those who are receiving water are also urged to heed the conservation notice. KIUC crews were also successful in restoring power to most members in Hanalei today. KIUC will continue to restore power on the north shore, as KIUC is able to access and repair its infrastructure. The water conservation notice from Princeville Utilities Co. Inc. continues for all its customers in Princeville, Anini Vista, Kalihiwai Bay Estates, Kapaka Road and Hanalei Plantation Road. Please be advised that as the pipe empties, it is possible that some air or sediment may enter your home plumbing. When turning on your faucet after water service is restored, please allow your water to run until it is clear to ensure flushing of any air or sediment from your plumbing. 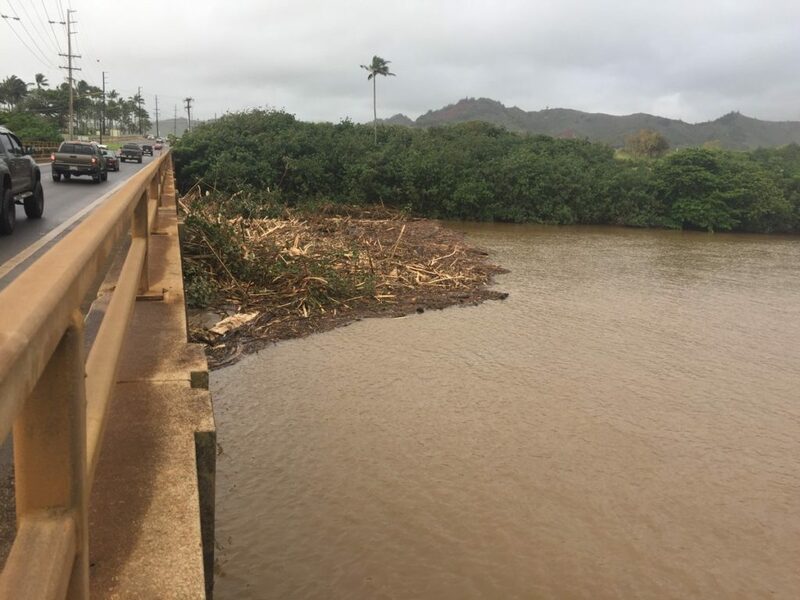 State Department of Transportation worked throughout today to clear landslides along Kūhiō Highway, while the Kaua‘i Utility Cooperative and Hawaiian Tel crew simultaneously work on repairs to fallen utility poles. Hanalei Plantation Road in Princeville remains closed due to a sinkhole. For updates on road conditions and closures, call (808) 241-1725. 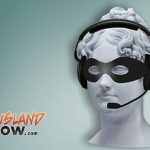 Do not call Kaua‘i police 911 unless you have an emergency. Heavy rains have caused storm water runoff throughout Kaua‘i, leading to widespread flooding producing large areas of standing water. Coastal waters have also been affected and a brown water advisory remains in effect until further notice.